We are the East Coast’s first food bank and lead the fight against hunger in Maryland. The Maryland Food Bank is a non-profit organization leading the movement to end hunger in Maryland. We have an extensive network of community and organizational partners across the state that distribute food to the Marylanders who need us. We supply the food to hundreds of food pantries, soup kitchens, shelters, and faith-based organizations that serve food-insecure Marylanders. We supplement this work with outreach programs that provide direct food assistance, educate the public on the importance of good nutrition, and fight hunger through innovative means. Learn about our carefully tailored programs, designed to address the immediate effects of hunger directly in local communities. The Maryland Food Bank’s fight against hunger takes on added momentum through ongoing awareness. Meet some of the Marylanders who benefit from programs and activities provided by the Maryland Food Bank and see if you recognize the true face of hunger. The Maryland Food Bank was founded in 1979 as the first food bank on the East Coast. In its first year, the Maryland Food Bank distributed 400,000 pounds of food to 38 assistance sites in Baltimore City. In 1981, the Maryland Food Bank expanded its focus, opening a branch on the Eastern Shore to better serve some of Maryland’s most impoverished counties. During much of the 1980s, the food bank worked to establish a strong foundation as the state’s central hunger-relief organization, building partnerships with food retailers and working with large agencies to create regional redistribution centers. For most of the ’90s, the Maryland Food Bank focused on building up its network of partners, teaming up with soup kitchens, shelters, and faith-based organizations across the state to distribute food to hungry Marylanders. During this time, MFB took on the Second Helping initiative and forged partnerships with Harvest for the Hungry and a host of other prominent hunger-relief organizations. In 2004, the Maryland Food Bank again expanded, transferring its headquarters from a 52,000 square-foot facility in Baltimore City to the current 93,000 square-foot warehouse in Baltimore County. With the increased space, the new facility has given the Maryland Food Bank the capacity to accept, store and ultimately distribute more food, growing its impact significantly. Its location, just miles from the city and sandwiched between two major highways, has also enabled more efficient distribution statewide. From 2008 to 2010, the Maryland Food Bank completed several capital improvements, including the expansion of the Eastern Shore branch’s freezer and the construction of the Charles T. Bauer Community Kitchen, a commercial-grade facility that allows us to reconstitute perishable foods into healthy frozen meals. In 2012, the Maryland Food Bank expanded its reach westward, merging with Food Resources in Hagerstown, MD. Since then, the Maryland Food Bank – Western Branch has more than doubled the output of food into Western, MD, distributing about 5.9 million meals in FY 2015 becoming the leading anti-hunger organization in the state. With more than 39 years under its belt, the Maryland Food Bank has built strong relationships with local businesses and received food donations from a broad range of manufacturers, growers, retailers, wholesalers and individual communities statewide. Today, the Maryland Food Bank is the heart of Maryland’s food assistance structure, providing food to a network of more than 1,250 soup kitchens, pantries, shelters, and other community-based organizations across the state. 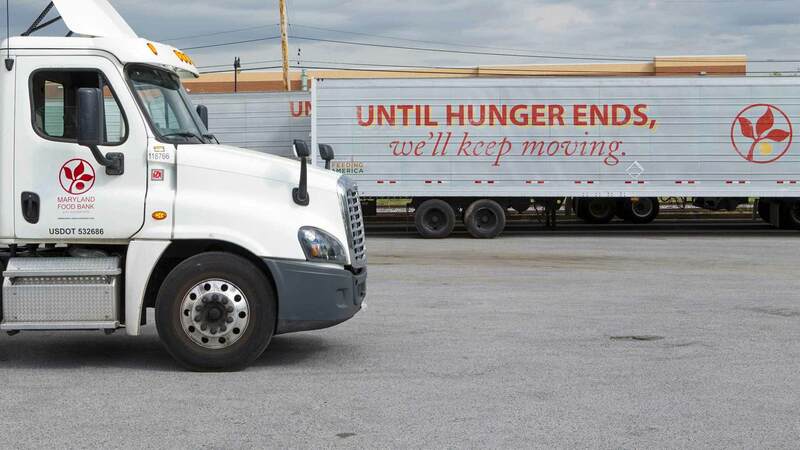 The Maryland Food Bank’s food distribution continues to increase every year, and the organization intends to expand its impact… until hunger ends. Programs, campaigns, and educational outreach at the Maryland Food Bank has always relied on the philanthropic support of charitable individuals like you. Much like our food distribution efforts, outreach activities at the Maryland Food Bank rely on generous donations of money and time.